This is the third installment of my self-publishing series. This week I’ll cover formatting and cover art. To check out information on traditional publishing vs self publishing, click HERE and my post on editing and proofreading can be found HERE. And now that you’ve got that manuscript polished and ready, it’s time to put the package together and formatted for uploading. Many authors choose to do their own formatting. I always tell authors … if you typed the manuscript, you can do your own formatting for upload. Before your manuscript is ready for formatting, you will need to add the FRONT MATTER for the digital book. Following is information I include on its own page. An acknowledgment is a special thank you to anyone who may have helped you with your novel, whether it’s a professional who helped with research, a critique group who helped in development or a special nod to your editor or cover artist. That would be included in the acknowledgment section. Many authors choose to dedicate the book to someone special. However, neither an acknowledgment nor dedication are necessary. Published by AUTHOR NAME of STATE OF RESIDENCE. This ebook is licensed for your personal enjoyment only. No part of this publication may be reproduced, stored in a retrieval system, or transmitted in any form or by any means, electronic, mechanical, recording or otherwise, without the prior written permission of the author. TABLE OF CONTENTS: Even digital books require an electronic table of contents that allows a reader to move easily within your story. With so many changes at Amazon, it seems Amazon is requiring authors to put their table of contents in the front of their book. A table of contents is created using the “Bookmark” feature and “Hyperlink within the document” feature. MS Word tutorials on bookmarking and hyperlinking within the document can be found on YouTube. EXCERPT: If you have other published works, you may want to put a short excerpt (of 3000 words or less) at the end of your story. OTHER PUBLISHED BOOKS: If you have other books you’ve published be sure to list them. Some authors have a single link to their website for readers to click and get more information. 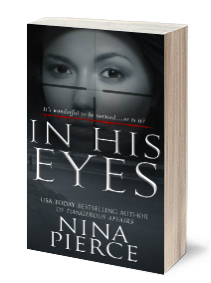 I create and upload different files to each individual retailer and have a live link like this one for IN HIS EYES that sends readers to the book at specific retailers. Jutoh – Converts Word documents to ePub, mobi (kindle), pdf and html formats. Currently selling for $39-$80, depending on version and features. I have worked a little with this program, but I found it cumbersome to use. Many formatters enjoy using this program for conversion. Scrivener – This program can be used for so much more than formatting. It’s a full organizational tool for your novel. Capabilities include organizing research notes and cataloguing fully written scenes and then organizing them into chapters. It can also be used for formatting Word documents for upload. Currently selling for $40. If all of that seems overwhelming, give me a shout. I do digital and print formatting. Check out my pricing HERE. 4. Draws people to read the blurb and hopefully go on to buy the book. Look at book covers in your genre. What elements do you like? What are some hard and fast elements you refuse? If you’re the artsy type there is software available for creating your own cover. (NOTE: Be sure you purchase the rights to use the images on your cover through a reputable royalty-free image site like iStockphoto or Hot Damn Stock Photos). There are several software formats for creating covers. GIMP: A free download for Windows. It’s a full featured, multi-platform graphics editor; and an image tool of choice for many graphic editors with common tools such as paint brush, pencil, airbrush, eraser and ink tools, with the capability of blending images. PHOTOSHOP ELEMENTS: This is a large graphics program, selling for $99, with many features. There is a free trial available as well, so you can try it out before you purchase. There are also many YouTube tutorials available online. If you prefer to have someone else make your covers there are several sources available. Pre-made covers range in price from $10-$85. Or you can hire a cover artist to make a one-of-a-kind cover for your novel. I HIGHLY recommend Dar Albert at Wicked Smart Designs. Her prices are very reasonable for both print and digital. She also offers pre-made covers. Though some cover artists offer only 3-4 design options, Dar works with you until you are happy with your cover.